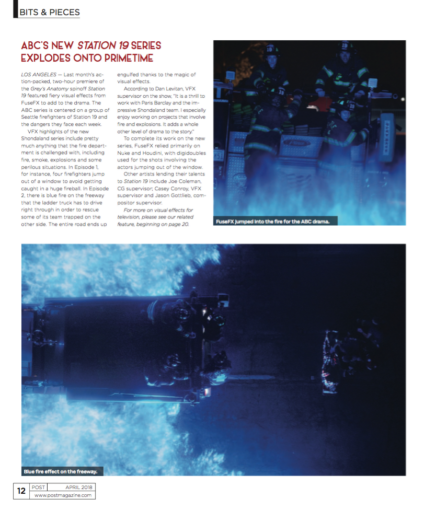 Here’s a snippet of Post Magazine’s write up on “Station 19” and the amazing VFX work provided by FuseFX. Last month, primetime viewers saw the premiere of the latest action-packed drama from Shondaland, a Grey’s Anatomy spinoff titled Station 19. The ABC series is focused on a group of Seattle firefighters and the perilous situations that they find themselves in, each week. FuseFX was tapped with bringing all of these dangerous escapades to life, and the VFX work is bountiful. For more information on their work, and to hear from the VFX Supervisor, Dan Levitan, check out Post Magazine’s article below.